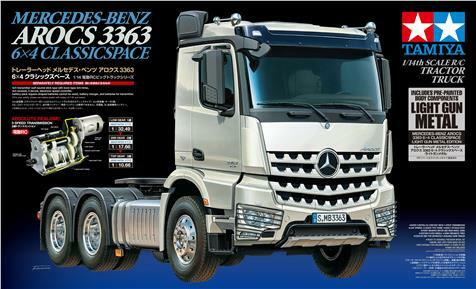 Special version of the Tamiya 56352 Mercedes Benz Arocs kit, the stylish 3-axle truck with the typical excavator-tooth radiator grille. An ideal opportunity for RC truckers who want to save themselves the complex painting of the cabin, H, K and M parts, because these parts are already painted in Light Gun Metal (TS-42) and provided with protective clear coat paint. This entry was posted in Future Releases on November 26, 2018 by admin.